This report overviews plans for a proposed Inclusive Tourism strategy. It was to be implemented during the FIFA 2014 Brazil World Cup. I developed this plan with four other senior-level experts in the area of tourism and disabilities. Although this plan was not implemented I present and endorse it here as an example of best practices that may be imitated in other countries. My purpose with this strategy and in this report is to provide a pragmatic example of Inclusive Tourism (http://www.slideshare.net/srains/universal-design-the-seven-principles) in a historical context with which I am very familiar. The deliverable in this strategy was to be a free itinerary developed for distribution to the tourism industry of Brazil. This itinerary includes the 12 Host Cities of World Cup 2014 and appropriately-formatted transportation information between them for travelers with four kinds of disabilities. The four kinds of disabilities covered in the strategy are: blindness, deafness, brain and cognitive disabilities and mobility-impairedness. In order to qualify as inclusive tourism this strategy must use Universal Design. Specifically it must involve Universal Design applied by the tourism industry to its product in every phase including planning marketing and implementation. Described in simple English this means imagining persons with disabilities as consumers from the beginning and integrating them seamlessly throughout the tourism product. Each state and municipality that hosted the FIFA 2014 Brazil World Cup had official organs designated for arranging and promoting the World Cup. Our team coordinated with each of these organs as well as with unofficial organs created by the disability and travel communities. In so doing we followed Inclusive Tourism's Universal Design protocols. These categories were described in the broadest way possible in order to yield the most pragmatic results in both languages. The product to be delivered to the tourism industry would have documented the actual conditions for inclusive travel available to visitors with disabilities at the time the report was made. The following four categories are descriptions of the disability not of the completeness of the deliverables that we proposed to produce. Complete or partial visual impairment. Complete or partial hearing impairment. Complete or partial impairment of any usually occurring cognitive ability. Complete or partial impairment of any usually occurring mobility function. Providing mere accessibility to a traveler with a disability is insulting. (http://www.slideshare.net/srains/accessibility-is-not-inclusion.) It is also not possible to sell such a product to a consumer with a disability. The core of our World Cup 2014 product was subsidized which positioned the Brazilian tourism industry to "sell" it back to us as consumers with no time or monetary investment on their part. Inclusion points in both directions. At times we are the guest invited to travel with non-disabled friends. At times we are the host fully paying for others to accompany us. As promoters of Inclusive Tourism we have no interest in travel information that does not embed us at every stage with those we choose to be traveling with. Having explained that the goal of our product I will leave technical details for my colleagues to explain. The Destinations for All World Summit 2014 welcomes practitioners and researchers from around the world to come together to exchange experiences and discuss the vital issues concerning the inclusion of people with disabilities and specific access requirements in tourism and travel. The aim of the Summit is to review the achievements that have been made in the world's leading accessible destinations, regions and cities, to share and discuss best practices and methods and to chart a course for the development of One World of Inclusive Tourism for Everyone. The Challenge of Accessibility in Global Tourism. There are about one billion people worldwide who have disabilities. Currently, that is about 15% of the total population. This percentage is expected to increase due to the aging population. Because disability increases with age, the large Baby Boomer generation is set to retire over the next 15 to 20 years and surveys show that they intend to travel in their retirement. By 2020, 40% will have some form of disability. Consequently, the tourism industry will be impacted by the current and future number of people with disabilities, and must adapt to this clientele by embracing accessibility in order to remain profitable and sustainable. This market is already too large to ignore, and will become even more so. The Economic Benefits of Inclusive Tourism, Culture, and Transport. The Baby Boomer generation - at least in the West - holds a significant amount of assets, has the most disposable spending power, and will control 50% of total tourism spending by 2020. Like other people, people with disabilities tend to travel with friends and/or family. That means that if a tourism business or service is inaccessible to any person with a disability travelling in a group it may therefore miss out on the potential economic return from the entire group. It is predicted that the accessible tourism market, although under-served, will account for 25% of total tourism spending by 2020. Countries, regions, cities, and enterprises that can fulfil the needs and aspirations of this market will gain competitive advantage over those that don't. In addition, many seniors have the possibility to travel all year round, so the effect of seasonality can be smoothed out by targeting this group. The Global Need for Sustainable Development: There is an increasing interest and investment by international bodies and governments in sustainable development. In order to develop sustainably, any industry must meet human needs while ensuring current and future sustainability of natural systems and environments. The human needs that must be met include the needs of the growing number of people with disabilities. Therefore, the tourism industry cannot become sustainable unless it improves and includes access for everyone in its development. Development that is both sustainable and inclusive is also an investment with many returns at the local, national, and international level. These include social and economic development and investment, employment and, wealth creation, and social sustainability for local communities. The importance and impact of international conventions and national human rights legislation to the development of accessible tourism. The right of people with disability to access tourism is now enshrined in international treaties and increasingly in national legislation. The United NationsConvention on the Rights of Persons with Disabilities -, which so far has 158 signatories - clearly lays out that people with disabilities have a right to access the physical environment, transportation, communications, recreation, leisure, tourism, and sporting activities. The Global Code of Ethics for Tourism adopted by the UN World Tourism Organization in 1999 states that tourism activities should (amongst other things) respect the individual rights of ...the elderly, the handicapped, ethnic minorities and indigenous peoples. Governments have enacted legislation that protects the right to access by people with disabilities that can be applied to tourism products and services. In addition, there is a growing interest in governments and across all industries to be acknowledged for corporate social responsibility. In tourism, accessible tourism provides the perfect tool to show that a company, a destination, or even a state or nation takes responsibility for its impact on social well-being. At this first World Summit we invite all actors and stakeholders to build, with us, a common framework for action, seeking to ensure that all tourism destinations and providers have the tools and strategies to make their environments, products, services and information accessible and inclusive to all visitors. It is time for all players in the tourism industry, big and small, to address and embrace this growing market and to cater to those who currently do not travel as much as they would like, have fewer choices when travelling, and whose experience of the world is governed by barriers which we have the ability to remove. Through examples of best practice cases, hard evidence and inspirational presentations, this Summit will show that Achieving Accessibility is a 'Win-Win-Win' for Destinations, Businesses, and Customers. Today, almost one person in ten in the world is over the age of 60. By 2050 that figure will be one in 5. There is a strong correlation between age and disability. Two thirds of people with disabilities are seniors. The needs of this growing population include physical, sensory and cognitive accessibility to enable them to travel and to participate in tourist sites and activities around the world. Accessible tourism is a fast growing market, but one that is still often ignored or poorly catered to. According to Article 30 of this Convention, States recognize the right of people with disabilities to participate in cultural activities, and will take all measures needed to ensure that everyone has access to cultural products in accessible formats, and to sites featuring cultural activities, including theatres, museums, cinemas, libraries, and tourism services, and, as much as possible, to heritage monuments and sites. People with disabilities travel like everyone else: for business, for pleasure, to visit family and friends, and to discover other cultures. Tourism may be seen by many as a luxury but increasingly it is regarded as a right. For tourism destinations and operators, catering to these customers is not only a moral obligation but also an economic opportunity. Tourism is an integration vector, being widely recognised for its inherent potential to engender understanding between peoples of different backgrounds. Assessing a tourist destination's accessibility means verifying the accessibility of its tourist services, hotels and restaurants, transportation, attractions and commerce. Tourism is also an internationalintegration vector: a tourist destination will want to be recognized according to international criteria; thus including accessibility for people with disabilities. "Tourism activities should respect the equality of men and women; they should promote human rights and, more particularly, the individual rights of the most vulnerable groups, notably children, the elderly, the handicapped, ethnic minorities and indigenous peoples." The Code covers various areas of application including consumer protection, corporate responsibility, the protection of children and of the most vulnerable segments of the population, cultural and environmental sustainability, dialogue between cultures, as well as its vision of tourism as a factor for development and for the promotion of fundamental human rights, in line with the United Nations Millennium Development Goals. In 2011, UNWTO formulated a Private Sector Commitment to the Global Code of Ethics for Tourism2, for the signatures of private businesses worldwide. In signing the commitment, companies pledge to uphold, promote and implement the values of responsible and sustainable tourism development championed by the Code. They further undertake to report on their implementation of the Code's principles in their corporate governance to the World Committee on Tourism Ethics. A special focus on social, cultural and economic matters is one of the main objectives of the Commitment, which draws particular attention to issues such as human rights, social inclusion, gender equality, accessibility, and the protection of vulnerable groups and host communities. As of October 2013, 175 companies and associations from around the world have signed the Private Sector Commitment to the Code of Ethics. These signatories include businesses from Armenia, Bahrain, Costa Rica, Cote d'Ivoire, Denmark, Ecuador, France, Germany, Hong Kong (China),Indonesia, Lithuania, Mexico, People's Republic of China, Poland, Republic of Korea, Romania, The Netherlands, Tunisia, Turkey, Spain,Sweden, and Uruguay as well as two regional associations from Latin America and Europe. It is a commonly held assumption in Western society that, to ensure long-term sustainability, economic development must embody both the physical environment and society in general. Too often, however, we limit sustainable development to the physical environment at the expense of our most vulnerable citizens. Development essentially looks to the future. Designing a building or even a destination to be accessible to those with disabilities can be done with little or no "additional" expense if this goal is incorporated at the planning and project specification stage. In this way, access contributes to sustainability by fostering better management of resources, reducing the need for renovations or adaptations to buildings later in their life-span. Moreover, meeting the needs of people with disabilities improves accessibility for everyone. Sustainable development must be inclusive. Inclusive development means offering all citizens an obstacle-free living environment that contributes to their quality of life, safety and well-being. Sustainable, inclusive environments and management practices are equally good for communities and those who come as visitors. For numerous international organizations, the objectives to be followed at the international level, beyond the Millennium Goals, must focus on the respect of human rights, both fundamental rights as well as sustainable development principles. Development that is both sustainable and inclusive is also an investment with many returns at the local, national, and international level. These include social and economic development and investment, employment and wealth creation, and social sustainability for local communities. Developing tourism destinations for all is not only a political and social obligation - it is also a major economic opportunity. The ageing demographic is already impacting the demand for accessible holiday experiences and as numbers of older travellers increase globally, businesses must respond to these changes in order to make their offers relevant and attractive to the senior market. Worldwide, there are over 1 billion people with some form of disability and with friends and family there are over 4 billion or almost a third of world's population directly affected by disability. The tourism industry must rise to the challenge of the changing demographic structure of the market and re-examine its product and service offerings. It is predicted that the accessible tourism market, although under-served, will account for 25% of total tourism spending by 2020. Looking forward just a few years, the proportion of people with disabilities will only continue to rise, given the general ageing of the population. The retiring Baby Boomer generation in western countries, in particular, will have a significant impact on the tourism market: they will control 50% of total tourism spending, 40% of then will have some form of disability, and by 2020, 25% of total worldwide tourism spending will be by travellers with a disability (McKinsey, 2007)3. For the tourism sector this opens up a wide range of opportunities for creating new products and services more suited to changing market demands. Existing infrastructures and facilities must be improved and new projects in transport, buildings and the built environment should be created through the practice of universal design, ensuring that the tourists of tomorrow will enjoy an inclusive experience having the support, comfort and safety they need, rather than facing new barriers and challenges. Despite the economic recession, the tourism sector is showing its ability to rebound, producing growth and jobs where other industries are slowing or in decline. Investing in accessibility gives destinations the opportunity of reaching a wider market and brings better prospects for communities - their businesses and citizens - both in economic terms and in a greatly improved quality of life. The 'new frontier' for tourist destinations and companies lies in creating better services and better value for all customers. In particular, serving the active, older customer provides compelling economic incentives. Countries, regions, cities and enterprises that can fulfill the needs and aspirations of this under-serviced market will gain competitive advantage over those that stick to their old recipes. Contrary to the stereotypes, older and disabled customers have just as wide a range of tastes and interests as any others and all areas of tourism can benefit by improving access. Widening the client base to all those who require good access also has other advantages, such as softening the effect of seasonality, as many of these visitors can travel off-season, not being bound by school or industrial holidays. At a time when economic stagnation and recession still threatens the global economy, the travel industry is showing some resilience, although positive trends are by no means present in all regions and countries. It is time for all players in the tourism industry, big and small, to address and embrace the wider market: to reach out to those 25% or so, who are still obliged to travel less, whose choices are limited, and whose experience of the world is governed by barriers which we have the ability to remove. When choosing routes, building trails, or developing new outdoor experiences for travelers don't overlook four-wheel mountain biking and handcycling. * Also known as Fourcross. 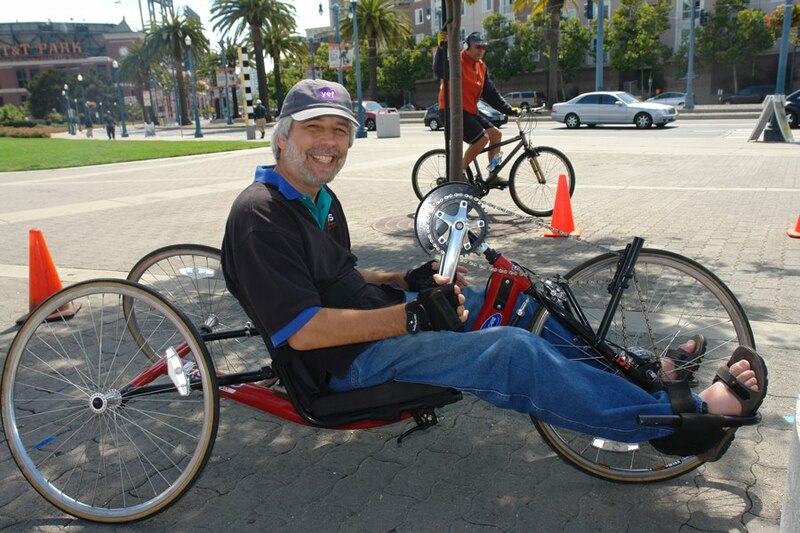 Handcycling was developed in the 1980s by people working to create alternate types of human-powered vehicles. So it was almost by accident that a new world of cycling was opened to people with disabilities. "It's ideal for people who have no or limited use of their legs, people who have poor balance, or anyone that just wants to try a different sport," said Heather Plucinski of Challenge Alaska. "It opens up a lot of trails and a lot of countryside, a lot of fresh air, and a lot of places you can travel. It's a great piece of adaptive equipment that allows people to get outside." "The disabled community picked up on it right away," said Ian Lawless, Colorado regional director and cycling director for Adaptive Adventures. Even people with one working arm can handcycle with some modifications made to the equipment, said Lawless. "Just about anyone can do it. It's an accessible sport. It's not just for racing; it's also for recreational riding. It's a barrier breaker that allows a disabled rider to participate in cycling with friends and families who may be riding conventional bicycles." Teacher Jeeja Ghosh is one of many disabled passengers in the region who experience discrimination in the air. Unfortunately for the air carrier that discriminated against her she is also a well-known and well-like personality internationally. If nothing else, good service against those who seem inconsequential prevents damage like this to the airline, airport and destination. The United Nation estimates the 1 billion people with disabilities populate the world. The tourism industry estimates that about 1/10 of those traveling at any one moment are people with disabilities and the rapid aging of the world population will raise that percentage significantly. Studies show that travelers with disability travel on average with 1.8 people and stay an average of 1.5 days longer than a non-disabled traveler. In addition they make travel decisions more on word-of-mouth than any other group. In other words, losing one trip by a traveler with a disability means losing 2 that were invisible and one hotel night sale as well as the word-of-mouth endorsement of a highly loyal market segment. Here follows two videos on an incident of airline discrimination against Disability Consultant Rajeev Rajan, demeaningly labeled a "patient" even though he was traveling as a professional to Delhi to testify on disability rights. Only one day after the incident those he was going to work for in Delhi threatened a lawsuit. 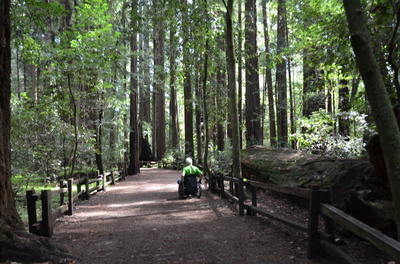 Although outdoor accessibility was something we as disability activists back-burnered as a political priority in the civil rights push of the 1970's - much to the disappointment of those of us whose lives revolved around the outdoors in the pacific Northwest of the USA - much progress has been made. One institution that has distinguished itself as a provider of technical assistance in outdoor access is the National Center on Accessibility. It began more than 20 years ago as a cooperative effort between the US Parks Service and Indiana University. The center looks not only at facility access but educates on the concept of program access as well. Practitioners often mistake the "program access" standard for only activities requiring advance registration, structured schedules and staffed by personnel or volunteers. However, "program access" really extends to the entire realm of opportunities, experiences and benefits. How does the program access standard in Title II of the Americans with Disabilities Act and Section 504 of the Rehabilitation Act apply to parks, recreation and places of tourism? In addition what does the provision for readily accessible and usable goods and services mean for places of public accommodation (Title III)? This 90-minute webinar brings together two of the foremost national experts on program access, John Wodatch, former Disability Section Chief at the Department of Justice, and Ray Bloomer, Accessibility Specialist with the National Park Service, and Director of Education at the National Center on Accessibility. From national parks to river boat cruises, museums to fitness centers, wildlife refuges to performing arts theaters what should every service provider in recreation and tourism know about program access for inclusion of people with disabilities? Join John and Ray for a candid discussion of the program access standard. FREE! 90 minute webinar archive. Original broadcast May 29, 2013. Produced by the National Center on Accessibility and the Great Lakes ADA Center. This session is part of the Arts and Recreation Webinar Series in collaboration with the ADA National Network, National Center on Accessibility, The John F. Kennedy Center for the Performing Arts and The Smithsonian Institution. Both Title II of the Americans with Disabilities Act and Section 504 of the Rehabilitation Act require state, local and federal entities to develop Transition Plans for the removal of architectural and communication barriers to participation by people with disabilities. But what does a Transition Plan look like? More importantly, what should be the process for developing and administering a successful Transition Plan? John Wodatch, former Disability Section Chief at the Department of Justice, provides an overview of transition plan requirements. Joining John are accessibility coordinators representing two of the largest federal and state park systems in the nation, Cheri Murdock, Yosemite National Park, and Carole Fraser, New York Department of Environmental Conservation. Learn how each Transition Plan is as unique as the entity developing it, what they used as guiding principles for prioritizing barrier removal, and other secrets to successful implementation. FREE! 90 minute webinar archive. Original broadcast July 10, 2013. Produced by the National Center on Accessibility and the Great Lakes ADA Center. This session is part of the Arts and Recreation Webinar Series in collaboration with the ADA National Network, National Center on Accessibility, The John F. Kennedy Center for the Performing Arts and The Smithsonian Institution. Universal design refers to the creation of structures and programs that can be used by all people. This online web module provides an introduction to the concept of Universal Design and its seven principles. In addition, the course presents the history, principles, and progress of Universal Design as it applies to the designer, programmer, and the consumer. FREE! 60 minutes. Produced by the National Center on Accessibility and the Eppley Institute for Parks and Public Lands at Indiana University-Bloomington. The purpose of this online learning module is to discuss Program Access as a beneficial and necessary concept in providing a meaningful experience to people with disabilities seeking to participate in parks and recreation. Within this comprehensive course, the learner will be introduced to the concepts and principles of Program Access, multiple examples of integrated services, and methods of Program Access implementation. What can be learned from the experience of mountain bikers? After all they are wheels-on-trails too. Equally important, in what ways is a mountain bike design unsuitable for a wheelchair user? The answers aren't in this post. This only begins to pose the question with an introduction on the sustainable - but too narrow for a wheelchair - single track trail-building practice of the International Mountain Bike Association (IMBA) and the construction of skillbuilding trail park in Colorado. The main takeaway from IMBA trailbuilding experience is their attention to environmental sustainability. Is there a place for the wheelchair, handcycle, or quadbike user in an environment like this in Community Bike Park in Valmont Bike Park in Colorado? From May 14 - 23, 2014 I will be traveling through Nepal providing technical assistance to the tourism industry on accommodating travelers with disabilities. I wanted to find our a little more about disability culture in Nepal. This post features the work of an Indian pioneer in wheelchair-accessible van transport - Prasad Phanasgoakar. From May 14 - 23, 2014 I will be traveling through Nepal providing technical assistance to the tourism industry on accommodating travelers with disabilities. This article looks at assiting a wheelchair user enter a platform lift-equipped van safely. Many factors go into the travel experience of someone with a disability. Coloring the very individual concerns of each traveler are their interactions with interlocking systems such as transportation to and parking at airports, ticketing and check-in, monitoring flight information, navigating the airport, airport security, comfort during plane changes and layovers, and comfort while in the air. This post looks at how the Transportation Security Administration (TSA) in the USA has attempted to balance human rights and security for travelers with disabilities and includes a sample training video featuring travelers with disabilities speaking for themselves. More than 2,600 [TSA] Passenger Support Specialists at airports across the country assist passengers who require additional assistance with security checkpoint screening. Passenger Support Specialists receive specialized disability training provided by TSA's Office of Civil Rights and Liberties, Ombudsman and Traveler Engagement. Training for Passenger Support Specialists include how to assist with individuals with special needs, how to communicate with passengers by listening and explaining, and disability etiquette and disability civil rights. Travelers requiring special accommodations or concerned about checkpoint screening may ask a checkpoint officer or supervisor for a Passenger Support Specialist who will provide on-the-spot assistance. Passengers with special circumstances may include travelers with disabilities or medical conditions, Wounded Warriors, passengers who wear specific religious clothing or head coverings and passengers struggling with understanding checkpoint procedures. Travelers may also request a Passenger Support specialist ahead of time by calling the TSA Cares hotline at 1-855-787-2227. From May 14 - 23, 2014 I will be traveling through Nepal providing technical assistance to the tourism industry on accommodating travelers with disabilities. This article looks at purchasing a vehicle modified for ease of use by someone who uses wheelchair. This consumer-focused video series by BraunAbility TV on selecting a wheelchair-accessible van is an excellent starting point for a technical discussion whether you are an individual purchasing one vehicle or a business looking for a fleet of reliable vehicles. We've put together a very informative video series to help you understand the things that can affect a wheelchair van's reliability, durability, safety, and performance. Our goal is to make sure that you get a wheelchair accessible vehicle that will satisfy your needs for years to come. There are 9 parts in this video series, including the introduction. Each video takes an in-depth look at the engineering, design, and manufacturing of the different vehicle systems within a minivan that's been converted for handicap use. The videos cover braking systems, exhaust systems, fuel systems, sliding door systems, suspension systems, electrical systems, and vehicle underbody. And then we wrap everything up with a video, called 'Making the Right Choice'.